The incident confirm by the spokes person of Northeast Frontier Railway on Sunday the trains maintain a speed limit of 20 km per hour in the elephant corridors, he added. 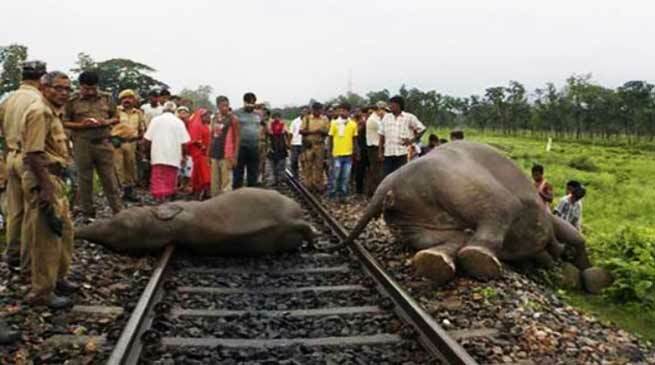 According to forest official , the herd of elephants was crossing the rail tracks at Habaipur near Lumding reserve forest when the Guwahati-Silchar Express hit them last night, killing five on the spot. The engine of the train was damaged and efforts were underway to restore train services at the earliest, he said. Meanwhile , atleast seventy elephants had lost their lives last year due to electrocution, speeding trains, poisoning, human attacks, and other accidents besides natural death, a forest department official said.